A healthy jawbone is part of good oral health. Its health is just as important as that of the teeth for overall comfort and efficiency. Just like the teeth, your jawbone can suffer from diseases. Once your jawbone is affected, your teeth, oral health, and general wellbeing are also affected. If you or your loved ones experience frequent headaches or a soreness of the jaw upon waking up, consult your Ria Family Dental dentist right away. It’s possible that your jaw has a disease that should be treated immediately to head off devastating effects. The following are the common diseases of the jaw. Bruxism – Your teeth may be damaged because of the excessive grinding caused by bruxism. It is the unconscious grinding of the upper and lower teeth and usually happens at night. Because of the excessive grinding, the teeth are chipped, fractured, flattened, and even become loose. The jawbone can also tighten and even lock, making it difficult to close or open. The pain can also include the ear, neck, and face, until it develops into a headache. Jaw infection– Severe tooth decay can spread infection to the jawbone. When the jawbone becomes infected, pain in the mouth or jaw, swelling of the jaw, and fever are likely to follow. 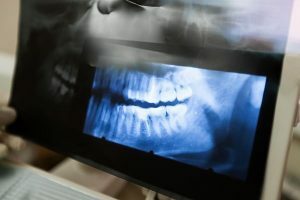 TMJ disorders –The temporomandibular (tem-puh-roe-mun-DIB-u-lur) joint, or the sliding hinge that connects your jawbone to your skull, can also suffer from various jaw diseases. Such defects in the jawbone include bruxism, earache, and clicking and popping of the jaw. Osteonecrosis – Also known as “death of the bone”, Osteonecrosis is a blood supply deficit in the jawbone. This is a common ailment in cancer patients receiving antiresorptive medications, or in some rare cases of tooth extraction. Blood supply deficit in the jawbone leads to its slow death, causing a heavy feeling in the jaw, tooth loss, and visible jawbone in the mouth. Jaw trauma –Accidents such as those from sports events can also put the jawbone at risk. Ria Family Dental has comprehensive treatments for diseases of the jaw. Treatment can vary according to the cause and severity of the condition. For instance, mild cases of bruxism can be managed with jaw exercises and night splints to protect the teeth. Those who engage in sports activities can use mouthguards as protection. Ria Family Dental offers custom-fitted mouthguards for optimum protection. It is important to understand that the jawbone is a vital part of your oral health. Any discomfort requires immediate consultation for quick treatment. At Ria Family Dental , we care not only for your teeth but for all the factors affecting your oral health. Our goal is for you to achieve optimal oral health for a lifetime.